Vice-President Mike Pence says the real work of repealing and replacing Obamacare will begin soon. At the Blaine’s Farm & Fleet Distribution Center in Janesville, Pence was joined Friday by President Trump’s Heatlh and Human Services Secretary, Tom Price. 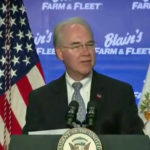 “We’ve got a fantastic team around President Trump to get that job done, and he is laser focused on making certain that this happens,” Price said. “The truth is just virtually every promise of Obamacare has been broken,” Pence said. He said a plan “built on a foundation of individual freedom and personal responsibility will replace Obamacare,” also known as the Affordable Care Act. “I’m going to make you a promise . . . and it’s just going to start happening in just a few days,” the vice president said. Pence and Price were joined by House Speaker Paul Ryan and U.S. Senator Ron Johnson. “The truth is that any of the Republican plans would leave Americans with worse care that is more expensive and harder to acquire,” said Representative Debra Kolste. The Janesville Democrat was on a call with reporters prior to Pence’s coments in Janesville.